Now is the time to check that your pumps and filters are functioning correctly for the season ahead, and give the pond a bit of a tidy. Phone to book your maintenance visit. As daily temperatures creep more reliably above 8-10C you can start to feed any fish, but be sure to pause if temperatures drop again. It’s wise to get some fresh food for the season, as old opened packs can soon become stale. You can read more tips on feeding fish on our help pages. If longer evenings encourage you to make more use of your outdoor space, why not add some garden lighting? Carefully sited lights can subtly illuminate waterfalls, fountains, trees, paths and ornaments. 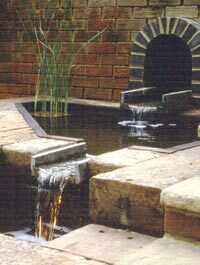 Water Garden Solutions can fit safe and hard-wearing low-voltage lighting to transform your garden, just ask for details. This entry was posted in General News, Seasonal Tips and tagged Lighting, Spring by James. Bookmark the permalink.